Today, May 6 marks the end of one writing project: creating a book of flash fiction with my fifth-grade students. They’re not really my students. But as part of the Taos Visiting Artists Program, I began working with Kathy Serna’s class for two hours a week beginning last fall. The photo above is the book’s cover. 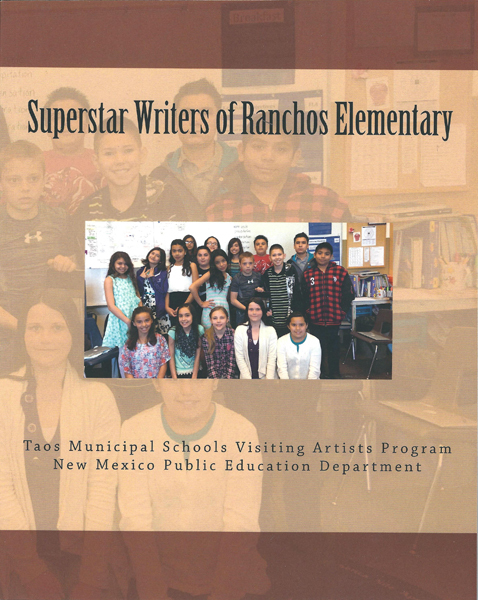 The students chose its name: Superstar Writers of Ranchos Elementary. And, yes, to me they are superstars. Today at a reception the public can see that, too. My life as a writer began in earnest in fifth-grade. Students from the town’s schools gathered on Wednesday afternoons to take an advanced course in science and creative writing. Guess which one caught my imagination? Then over the months we spent together, I gave them five writing prompts: A Picture Is Worth 750 Words; Along With Paul Revere’s Ride; Three Inches Tall; My Neighbor Is a Giant; and I Have a Superpower. The students were given a word count for each. Their teacher and I worked alongside the students, encouraging them. A few, whose first language is Spanish, wrote in English. One boy wrote in Spanish. Hopefully, this experience was as rewarding to the students as it was for me. Their teacher said her students wouldn’t have had such opportunities to write without this program. Yes, I believe their creativity and confidence increased over those months. One student wrote a story about living in a sink of dirty dishes. Another told Paul Revere’s ride from the perspective of his horse, Brown Beauty. One student wrote a giant stepped on her father — but a potion save him. Here is one called “The Battle,” by Elijah. 3-5-20: Have you ever wanted to join the ant army? Well, don’t. Let me tell you why. If you’re three inches tall like me and a human, then you are unlucky. I was a mad scientist’s puppet for a long time until one day he shrunk me and I got away. Then about three days later, the ants found me. The Midway Ants found me, I meant. They raised me, fed me, all the stuff a child needs to stay alive. I was always a little bit bigger than the other ants, but they didn’t mind. Neither did I. When I was 16, I joined the Midway Ant Army. Now in 2020, there is another ant war. Midway vs. Fullway! It’s three days until I get sent to the army. My birthday is tomorrow. 3-6-20: Today is my birthday, but I have no one to celebrate it with because everyone is freaking out about the ant war. Well, I need to go train in base camp. I’ll probably document again tomorrow. 3-7-20: It’s 6:30 p.m. and I’m going to bed, so I can be ready for the war. God bless Midway! Day of the War: Right now as I write, my left arm is not working, so this is pretty hard for me. I got bit three times and shot once. It hurts so bad. If anyone ever gets a hold of this, please send help. We are under attack. I don’t think I’m going to survive. Midway Loses the War: Sgt. Elijah almost won the war for Midway, but Fullway had the upper hand. Now all Midway Ants are extinct. These are the last documents Sgt. Elijah took. God bless Midway! Many asked me to sign their books. This is what I wrote: “Keep writing.” And I meant it. 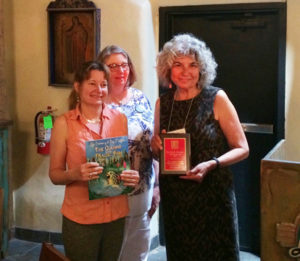 ABOUT LOS PRIMOS: The bilingual kids books “The Cousins and the Magic Fish/Los Primos y el Pez Mágico” got some recognition when the New Mexico Press Women named it second runner up for the Zia Award. I was the author and Teresa Dovalpage, the translator. My son, Ezra, created the illustrations. Teresa and I were at the conference in Las Cruces to accept the award and read from the book. Jessica Savage, with the NM Press Women, is behind us.